By now, the word is out that local resident, RECoyote Mindes, has been helping out some members of the community. This story has grown on me and even made me a part of it. When I first began hearing of it, my friend and co-artist, Valkrye, announced that the coyote was sending her a powerful computer and a Wacom cintiq display/drawing board. Lucky Val! In my dreams, thought I, knowing how such a set up would aid my own art. After a week, I got an IM from REC, saying that he was also sending me the same equipment. I was stunned. Was this some kind of April Fools joke? Since I was now in the group of people that were being assisted, I began hearing details of how much and who was being helped. We were all being helped in real life, but the effects directly ripple through our SL community. I contemplated that since he was helping Second Life residents, one could estimate the amount of Linden Dollars that would equal. Mind you, at the time I did the math, I only knew of a handful of cases, but it was adding up to over twelve million Linden Dollars. Now it was beginning to look like a news story that folks need to see. In a conversation with Rita Mariner, I half jokingly said' Maybe we should put up a coyote statue in the town square. She adopted the idea and we've played with building one. I think she wants to add pigeons to poop on it. I have always been a big supporter of building healthy communities. If there are punishments for bad behavior, there should also be rewards for good behavior. Perhaps, like Oscars and Emmies, we could create an award for those that have given generously of their services to the community. I told Rita I was thinking of making such a reward and giving it to her to give out as she and or a committee decided. I made a walnut base and made the top design of translucent woven gold, which glows and gives off light. The gold forms a symbol, which is based on the universal thought-form that joy creates. The shape can be found in a smiley face, the SL hand logo and there is a hint of an all seeing eye, in the center. When the build was completed, I was delighted to discover that it seems to radiate joy, when you come near it. I call it the "Sunny" award. So now I'm writing a story about a community hero, an award and a statue. Good heroes tend to be humble, so I think it best to go ask the yote if it's OK to write a story about him. I found him, relaxing at home with Perri. As I meandered up, shuffling my feet and clearing my throat, I made my request. His initial response was a heroic please no, but Perri quickly pointed out that, with the wide reaching benefits to community, having a "hero" will lift their eyes to the behaviors that lead to building a better world. With that in mind, he decided this article would be OK and I could ask him more questions. I began with my favorite question, "Was there a "spirit" or inspiration that led to his actions?". He just said, "I like to help". What does he do in RL? He drives a tank truck, hauling blood. He said, "I drive truck. I love to drive, but hate driving". Driving is hard on the body and he's getting where he can't handle some equipment and climbing up in the cab is painful. Asked about the source of this new wealth, I learned it came with the sale of some land that had been passed down in his family. As we talked, we were joined by Niko and Erik. When I told REC that my artistic service would be freely given to him, the group began talking about how a coop of local artists would benefit them and the community. Pooling our talents, we could produce illustrated and or animated stories, with a potential attention and even income to the artists. I mentioned that Erik had also shown interest in creating graphic stories and could use Sunny Beach for "location" backgrounds for pictures and movies, a mini Hollywood. This is the ripple effect, which started with REC's help. Community members, joining to make a better world. 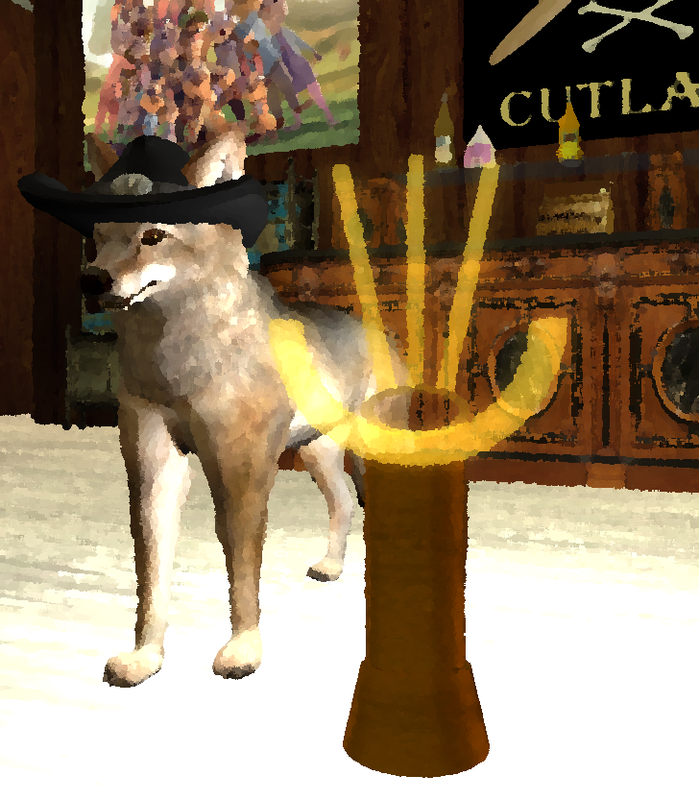 I hope readers will join in honoring RECoyote, for his humble services to the community that loves him. In my consideration, the best Bitcoin exchange company is YoBit. Ever consider automating your free satoshi collections by using a BITCOIN FAUCET ROTATOR? YoBit allows you to claim FREE CRYPTO-COINS from over 100 different crypto-currencies, you complete a captcha once and claim as much as coins you want from the available offers. The coins will safe in your account, and you can convert them to Bitcoins or USD. If you are trying to buy bitcoins online, PAXFUL is the best source for bitcoins as it allows buying bitcoins by 100's of payment methods, such as MoneyGram, Western Union, PayPal, Visa, MasterCard, American Express and even converting your gift cards for bitcoins. Learn from experienced eToro traders or copy their trades automatically!